This linear light is a great solution when very-bright illumination is needed in short bursts. 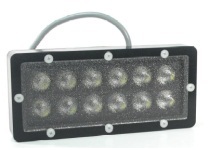 For example, this is a great light for high-resolution inspection of printed materials traveling fast. It delivers 8 amps for up to 3 ms, then drops back to 1.4 amp regulated illumination. It is stable up to 1000 Hz with 43 µs pulses. The light and controller have been designed to rapidly turn on the LEDs. The controller (included) accepts both NPN and PNP strobe triggers. Integral capacitors reduce the surging current demand. The standard cable (included) is 4 meters long. Contact us for pricing on cables up to 15 meters long. Window: Shower Glass Diffuser Optional diffusers: White, white semi-opaque, shower glass, thin film, or linear polarizer.